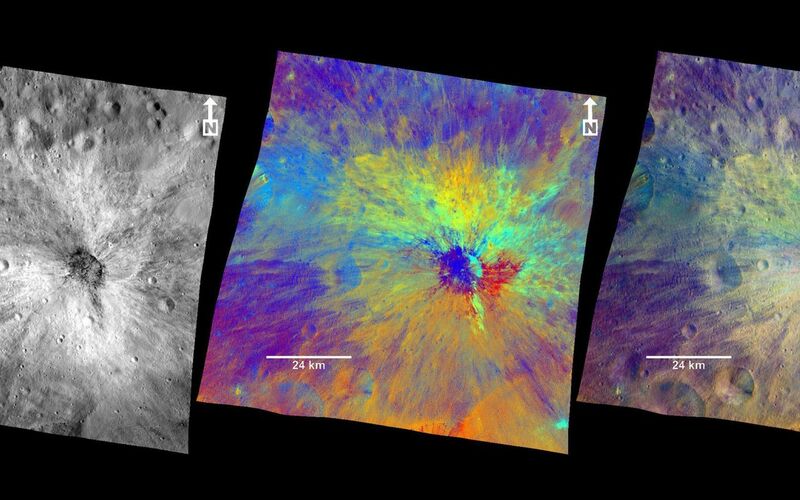 These composite images from the framing camera aboard NASA's Dawn spacecraft show three views of the comparatively fresh crater named Vibidia on the giant asteroid Vesta. A black-and-white image that highlights topography, a colorized image that highlights composition and a combination of the black-and-white and colorized images to show the relationship between topography and composition are included here. The impact that created Vibidia occurred at the edge of a cratered highland in the equatorial region and extends to a basin known as Veneneia. It appears to be located in a gentle depression, presumably an older crater. Scientists think a relatively small object caused the crater, which features many boulders inside and rays of dark material. As on the moon, bright rays can be the result of compositional differences in material thrown out by the impact compared to the surrounding terrain. Or bright rays can indicate differences in maturity -- that is, the amount of time the surface has been exposed to subsequent bombardment by micrometeoroids and cosmic rays. Vibidia exhibits a particularly colorful blanket of ejected material, demonstrating that the surface and the layer just beneath are made up of many different kinds of materials. 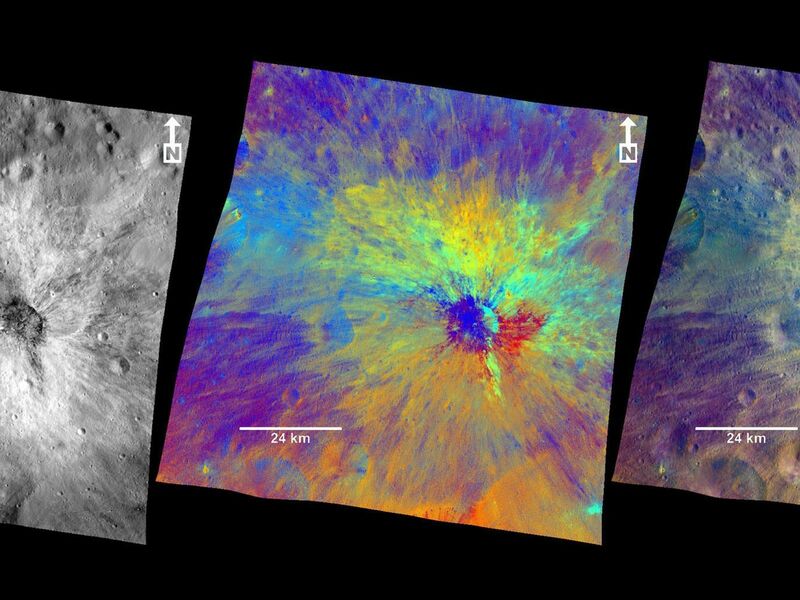 These patterns reflect a complex interplay of ancient volcanic and impact processes that shaped Vesta's crust. The impact that created Vibidia also appears to have caused an area with a width five times the diameter of the crater to collapse. 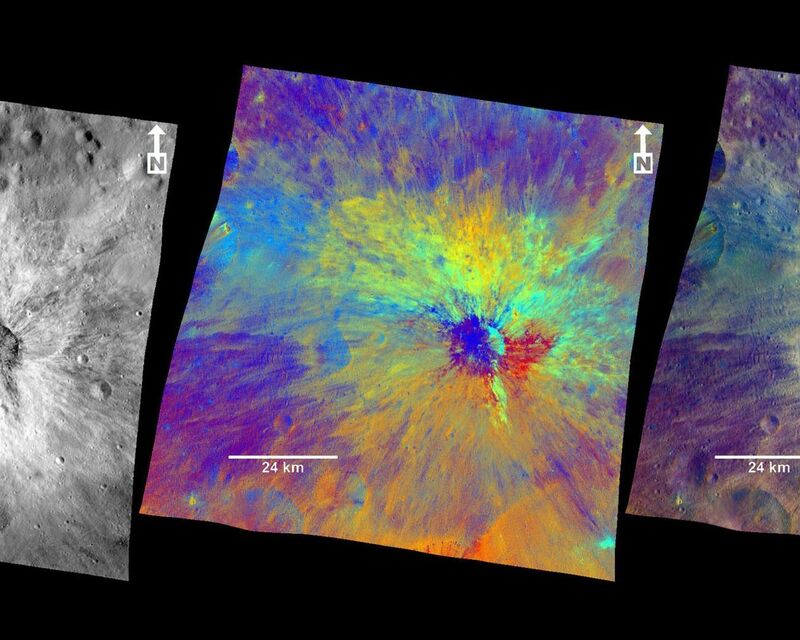 The framing camera has seven color filters that allow it to image Vesta in a number of different wavelengths of light. Being able to image in many wavelengths enhances features and colors that would otherwise be indistinguishable to the human eye. In this colorized image, scientists assigned different color channels to specific ratios of wavelengths of radiation. In this scheme, green shows the relative strength of a particular mineralogical characteristic -- the absorption of iron. Brighter green signifies a higher relative strength of this band, which indicates chemistry involving pyroxene. On the other hand, reddish colors indicate either a different mineralogy or a stronger weathered surface. These images are composite images made from those taken during Dawn's high-altitude mapping orbit (420 miles or 680 kilometers above the surface) on Oct 27, 2011. They cover an area that is about 40 by 40 miles (60 by 60 kilometers). This area is near the edge of the Rheasilvia basin in Vesta's southern hemisphere. The Dawn mission to Vesta and Ceres is managed by NASA's Jet Propulsion Laboratory, a division of the California Institute of Technology in Pasadena, for NASA's Science Mission Directorate, Washington. UCLA is responsible for overall Dawn mission science. The Dawn framing cameras were developed and built under the leadership of the Max Planck Institute for Solar System Research, Katlenburg-Lindau, Germany, with significant contributions by DLR German Aerospace Center, Institute ofPlanetary Research, Berlin, and in coordination with the Institute of Computer and Communication Network Engineering, Braunschweig. The framing camera project is funded by the Max Planck Society, DLR and NASA/JPL.